Thanks to those who have tested the previous version of LockRattler on Macs with T2 chips, I can now offer another new version which should handle those more gracefully, and cater better for anyone using the app to check their EFI firmware. 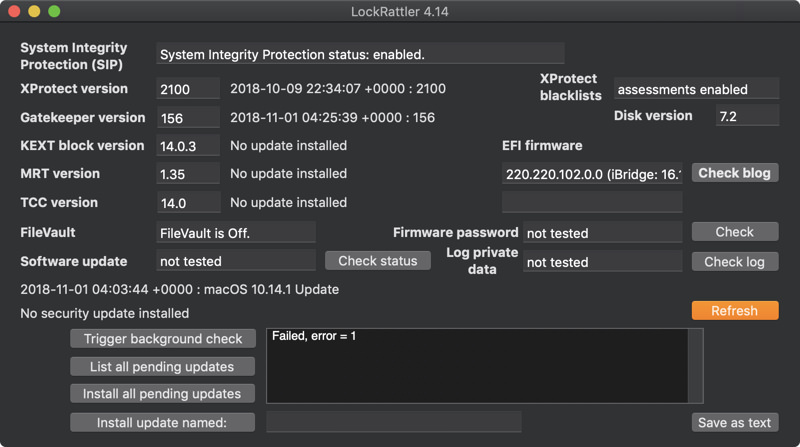 LockRattler 4.14 now detects whether the eficheck command is available on your Mac, and from that and the version of macOS which it is running, can discover whether your Mac has a T2 chip. If you’re running El Capitan or Sierra, then it will check the ‘new’ EFI version number and report that. If your Mac doesn’t have a T2 chip and is running High Sierra or later, LockRattler should now report two EFI firmware version numbers, the ‘new’ one and the version reported by eficheck. Finally, if your Mac has a T2 chip, the app should now report the ‘new’ version number for the EFI firmware and iBridge. If LockRattler encounters an error in obtaining any of these firmware versions, this is reported more clearly in the scrolling text box below. The other issue with checking EFI firmware versions is how to look your results up to determine whether your firmware is up to date. That not only depends on whether it had a firmware update when updating Sierra, High Sierra, or Mojave last week, but which version numbering system you wish to use. For the moment at least I think that it is best to let you use human judgement to work this out, rather than try machine heuristics which could err at times. So this new version of LockRattler has a direct link to the article here which lists EFI firmware versions, from a command in its Help menu. Posted in Macs, Technology and tagged EFI, El Capitan, firmware, High Sierra, LockRattler, macOS, Mojave, security, Sierra, update. Bookmark the permalink. It would be nice if you could add a function to force the firmware upgrade from the ESDinstall package! It can be scripted so might be doable! I hate to be unhelpful, but that is a bit of a nightmare. The ESD packages aren’t intended for ordinary users, and if LockRattler were to start pulling them down a lot, I don’t think that Apple would be amused. It’s also going to be very complex for each firmware update, which is why Apple wants users to rely on macOS updates and security updaters. I think that I’d rather keep away from that, but thanks for your invitation! Yes, I understand, but the bigger nightmare is a 2015 MBP that won’t take the HS firmware update for some reason! It has affected a lot of people (see MacRumors). Thanks anyhow for all your great utilities. And the BEST website I`ve seen in a long while. It’s all so strange: just over a year ago, Apple was going to end all this firmware chaos. It had (and has) some excellent engineers who worked on the problem, came up with eficheck and more, and it was all becoming sweetness and light. Then in a single firmware update – which Apple didn’t even mention in the release notes, let alone warn users that the version numbers would all change – it seems to have undone all that work. Out of the jaws of success it snatched defeat! Howard, thank you for your continiued refinement of LockRattler. Shows efi with iBridge extensions, but still has Failed, error = 1 in scrolling window. This would be clearer with a screenshot; I can’t figure out how to do that with WordPress? Thank you, Phil. No, WP doesn’t seem to like screenshots in comments. I’m puzzled by that error, which suggests that something hasn’t quite worked out right in my trick to avoid calling eficheck when there’s a T2. I’ll work through the logic again. I suppose this is another good reason for getting a new Mac with a T2 chip, at least I’ll be able to do my own testing (I also have an MBP without a T2). Problem solved, or rather not solved: my test relied on the T2 not having eficheck installed, which was I though the situation on Macs with T2 chips. The only way that the test can fail is if eficheck is installed in the usual place – so my ‘test’ doesn’t actually tell whether there is a T2 present. Damn! Back to the drawing board. It’s also pretty stupid to have a tool there which the Mac can’t even run and doesn’t work if it tries to run it. I read your other comment regarding upgrading an iMac. Apple has made it so frustrating with not only its hardware, but especially pricing which I presume is to inflate margins. I got the 2018 13 inch TouchBar because my three year old Macbook 12 inch decided to not boot no matter how it was charged. The difference between one and four USB-C ports is relatively useful. The Macbook rather anemic battery was a real handicap with only one USB-C port. On your article 3rd update on EFI versions, one of the commenter, Joss did have a screenshot in the comments, which I found rather amazing. Per your comment 7. I checked my T2 MacBook Pro and your intuition is correct, eficheck is present in the expected location. Repeating this with eficheck-standalone gave the same error message. This is all very confusing, especially for one that has little programming experience! Thank you, Phil. I think this latest version should have nailed it at last.